HARD ROCK CAFE HAMBURG 2nd ANNIVERSARY STAFF GOLD PIN. HARD ROCK CAFE HAMBURG 3rd ANNIVERSARY CAFE PIN. HARD ROCK CAFE HAMBURG 3rd ANNIVERSARY CAFE VIP PIN LE30. HARD ROCK CAFE HAMBURG 4th ANNIVERSARY ROCK SHOP PIN. HARD ROCK CAFE HAMBURG 5th ANNIVERSARY CAFE PIN. HARD ROCK CAFE HAMBURG 5th ANNIVERSARY CAFE STAFF PIN. 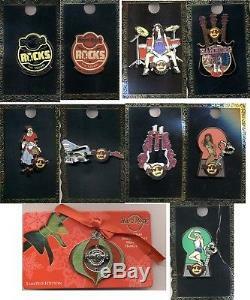 HARD ROCK CAFE HAMBURG 5th ANNIVERSARY ROCK SHOP STAFF PIN LE50. HARD ROCK CAFE HAMBURG DN CITY GUITAR 2012 PIN. HARD ROCK CAFE HAMBURG DN WHITE GUITAR 2012 PIN. HARD ROCK CAFE HAMBURG EASTERN 2012 PIN. HARD ROCK CAFE HAMBURG FLOWER 2012 PIN. HARD ROCK CAFE HAMBURG GIRL SITTING ON DRUM 2012 PIN. HARD ROCK CAFE HAMBURG HOLIDAY ORNAMENT SPINNER 2014 PIN. HARD ROCK CAFE HAMBURG KEYHOLE GIRL #3 PIN RED. HARD ROCK CAFE HAMBURG KEYHOLE GIRL #4 PIN GREEN. HARD ROCK CAFE HAMBURG PEACE PLEKTRON 2012 PIN. HARD ROCK CAFE HAMBURG ROCK THE SQUARE 2013 PIN. HARD ROCK CAFE HAMBURG ROCK THE SQUARE 2014 PIN. HARD ROCK CAFE HAMBURG SEILBAHN GUITAR 2014 PIN. HARD ROCK CAFE HAMBURG ZITRONENJETTE 2014 PIN. The item "HARD ROCK CAFE HAMBURG 20 PINS STAFF VIP" is in sale since Tuesday, November 20, 2018. This item is in the category "Sammeln & Seltenes\Pins & Anstecknadeln\Pins, moderne\Hard Rock Café". The seller is "budweiserhrc" and is located in Berlin. This item can be shipped worldwide.